In the foreground is the original “holding building” for winter keeping until the spring thaw. 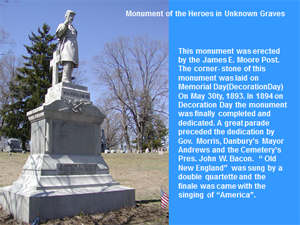 In the background is the to Gen. David Wooster monument. 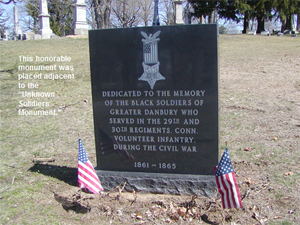 On April 27th, 1854 Wooster Cemetery was dedicated to the memory of General David Wooster who succumbed to a bullet wound on May 2, 1777 during the attack on Gen. Tryon's British troops that had burned 19 buildings of the Town of Danbury as suppliers of goods to the patriots of the Revolutionary War. 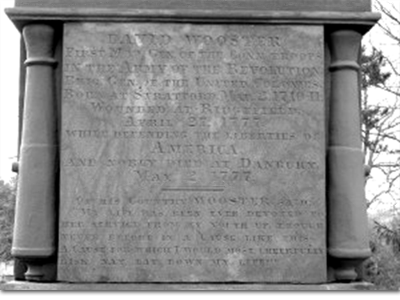 In 1776, Wooster was appointed a major general in the militia of Connecticut in the American Revolutionary War. 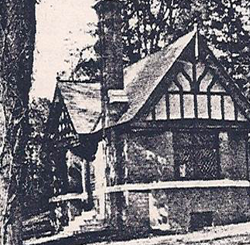 Wooster had supervisory control of all military supplies that were stored in houses near the town of Danbury. General Tryon of the British army planned to attack Danbury in order to capture Wooster's supplies. 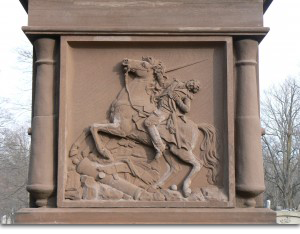 On April 27, 1777, Wooster attempted to head off General Tryon's advance in the nearby town of Ridgefield, Connecticut. Wooster attacked Tryon's forces with 700 new recruits but Wooster was forced to retreat. Being inexperienced militia, and the enemy having several field-pieces, our men, after doing considerable execution, were broken and gave way. The General was rallying them when he received a mortal wound. A musket ball took him obliquely, broke his back-bone, lodged in his stomach and could not be extracted. His sash was spread out as a blanket and Dr. Turner dressed the wound in the field. Wooster was then carried from the field to a waiting carriage and slowly transported him to Danbury. He was taken to the Dibble house on South St.
A doctor came from New Haven to attend to Wooster. His wife and son arrived from New Haven only to watch for 3 days as he suffered in agony until overcome with unconsciousness. 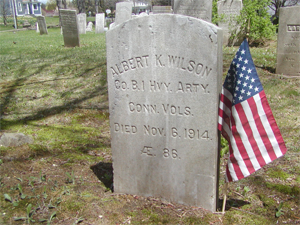 He died on May 2, 1777. on April 27th, 1852, his remains were taken from Wooster St. Burial-Ground, and placed in Wooster Cemetery. 5 days after to mortal wound, on May 2, 1777, Wooster succumbed to the fatal shot. Wooster's finals words were, "I am dying, but with a strong hope and persuasion that my country will gain her independence." 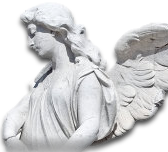 Today, a monument 30 feet high marks his final resting place because of the efforts of the founders of Wooster Cemetery. 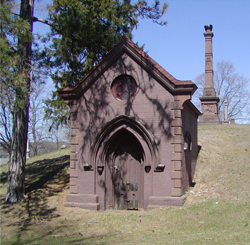 General Wooster is buried in the Wooster cemetery on Mount Moriah, which dates from the middle of the nineteenth century. 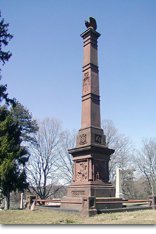 Wooster's monument is surrounded by a stone and iron railing. 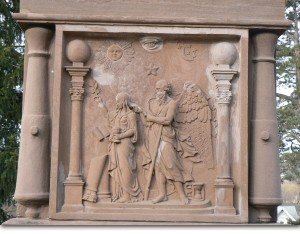 The monument is heavily carved with a variety of military and Masonic symbols, as well as classical Greek motifs. Among extensive information carved into the monument is this quote, "Of his country Wooster said, 'my life has ever been devoted to her services from my youth up, though never before in a cause like this - a cause for which I would most cheerfully risk and lay down my life'. The historian of that day (Gordon), in relating this transaction, says of him: "The General behaved with great valor, and lost his life gloriously in defending the liberties of America, at the advanced age of seventy." 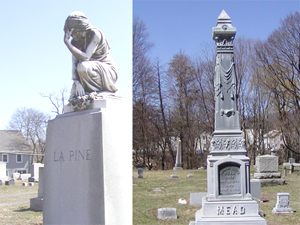 Copyright © 2014 Wooster Cemetery. All Rights Reserved.